Handling the commercial waste is not an easy task. A lot of resources and large units are required for its proper disposal in the dumps. Relying on an inexperienced company which lacks the necessary equipment to carry out the job can prove to be a waste of time and money for you. No risk can be taken while dealing with tasks of such magnitude, therefore, your choice should always be someone who provides guaranteed quality in their services. Zaks Bin Hire has the largest fleet of skips and can provide the high-quality services according to your needs. We have spent plenty of years in this field so our knowledge and expertise cannot be matched by anyone else in the industry. 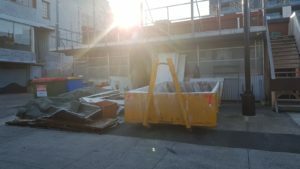 Humongous waste is produced at construction sites and the difficulty level involved in rubbish removal in Melbourne is quite high. Most of the construction companies in the city rely on Zaks Bin Hire to dispose of all the waste produced from items like timber, metal scrapes, and concrete. If not taken care of in the right way, these materials vastly contribute to the ever-growing pollution, causing great damage to the environment. Our wide resources and the various skip sizes available help the clients in deciding the perfect match as per the need of their project. If the size of the skip is in accordance with the magnitude of the project, the process of waste disposal becomes quite convenient. We do not cater to only a limited type of customers but address the needs of the smallest to the largest construction companies and builders. Working at such a large magnitude, the construction companies cannot afford a single mistake or a delay in their operations as it can lead to significant losses. The commercial skip bin hire services at Zaks Bin Hire provide the customized front lift bins in combination with the rear lift bins to provide optimized results to the clients and leave the site spotless after the cleaning process. Such bins are the most appropriate and sustainable waste management solution for all kinds of firms irrespective of their size. Be it commercial or industrial waste, our approach to addressing the wishes of our clients and collecting the waste timely and efficiently have helped us create a name for ourselves in the industry. Our customers in Melbourne can never deny our dedication towards the high standards of customer service and environmental matters. You need to follow a fairly simple process for our skip bin hire services and we will present you with a customized plan to suit your needs. We firmly believe that each and every client contributes to the bottom line of our company and helps us in becoming the most sought-after name in rubbish removal Melbourne. It is our civic duty to contribute towards the recycling efforts as much as we can so that our surroundings stay protected from pollution and hazardous wastes. Keeping in line with this motto of ours, we make sure that at least 90% of the waste collected from various commercial units is recycled at our waste management stations. This leaves the citizens of Melbourne free from the stress of worrying where all the debris actually goes! We can easily manage the waste produced in the form of items like soil, concrete, sand, clay, brick, asphalt, tiles, and other general building leftover and never let it become a contributing factor towards the environmental pollution. Based in Melbourne, our major focus is to cater to the needs of the clients in our area but this doesn’t mean that our services are not available to someone who resides outside the city. Each and every client of ours is equally important for us so we ensure that there is no compromise on the quality of services which are provided to them. Zaks Bin Hire has the perfect commercial skip bins which are suitable for all your needs and can be availed at a price which is lesser than our competitors. Providing affordable and stress-free services to our clients forms the basis of our agenda and we never compromise on it. One of our most important rules is that we never make our clients rush to fill the skip bins. Being in the industry for such a long while, we do realize that it is a tedious task and requires a lot of time and carefulness. The satisfaction of our clients is more important for us than just saving a few extra minutes during our service hours. There are no extra charges involved if the client needs some time to get the job done because we do not work just for monetary purposes. We believe that we serve a higher purpose of saving the environment; so we try our best to contribute maximum waste for recycling purposes so that our generations do not have to suffer at our hands. To know more about our commercial skip bin hire services as per your distinct needs, make a call to our agent. Our expert will give you the right opinion and ensure that your minimum time and money is spent to avail the best of our services. Come in contact with us without any delay and let all your skip bin needs be addressed on time.